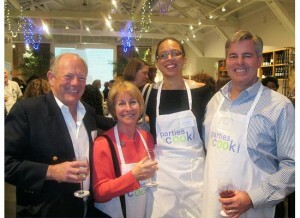 Last Wednesday night, Parties That Cook hosted Cooking Up Success for Women’s Initiative. Women’s Initiative for Self Employment is a Bay Area non-profit that provides high-potential, lower-income women the training, resources and on-going support to start and grow their business. This amazing organization has been in San Francisco for 23 years, and has served more than 22,000 low-income women to date! The Cooking Up Success event was a great opportunity for us to give back to the community, and with nearly 100 guests coming together in support of Women’s Initiative, it was clear that this hands-on cooking event was a HUGE success! Bibby gave her famous interactive cooking demo, with insightful tips and tricks for the evening’s recipes. Attendees were all smiles throughout the event, as they broke up into smaller teams to create the menu of international tapas. Guests also had the chance to hear their inspiring entrepreneurial stories of four graduates from Women’s Initiative. The event raised over $16,000! That’s enough money to put 8 women through the Women’s Initiative’s business management training program, potentially create 18 new jobs and put $480,000 back into the community! Parties That Cook is proud to lend a hand to our community.